Here are some useful hints and tips to make your Florida paddling experience more enjoyable and safe. Do not feed or molest wildlife, keep your distance from wildlife so they are not disturbed. File a float plan or make sure someone knows where you are going. Abuse or use of intoxicants is dangerous and may lead to arrest or worst! Follow the "Rules of the Road". Contrary to popular belief, human-powered vessels do not always have the right-of-way. The vessel with the least manuverability must be given "lee" or right-of-way. 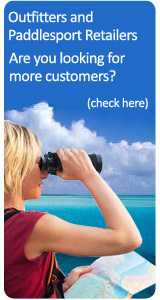 I.E., a supertanker has the right away, a boat in the Intercoastal Waterway has the right of way. The tanker can't make sharp turns and like the motorboat, has to stay in the assigned channel to run. And that's a two-way street. Motorized watercraft need to afford the slower, less stable human-powered vessels lee when necessary and all need to exhibit common courtesy to each other. Share the waterway and play nice! 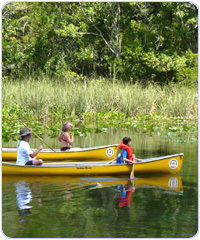 Visit http://www.americancanoe.org/?page=Top_10 for all kinds of paddling info. Info is for the beginner but there is all kinds of excellent info for paddlers of all stages of experience. Interested in taking your canine friend paddling? Click here for more info.